One quiet Sunday a few weeks ago, the door to my in-laws home opened and an unexpected but much hoped for visit had begun. My 90 year old mother-in-law, Doris, (I call her mom) reached out to hug her thirty year old grandson. Allen. And just like that -Baby Reagan was placed in her lap. Doris beamed. It was quite a surreal moment for all of them. I don’t’ think they imagined just a few weeks earlier they would be meeting each other so soon. There were 30 years of life behind them -never having met before- yet family all the same. I only wish that my father-in-law could grasp what a special moment this was – but Alzheimer’s has taken his memory so he was there in body but sadly he would not remember the meeting. A number of years before I married into this family, my brother-in-law, Rich, told his parents that he had fathered a child who was given up for adoption. I can’t share all the details of the story as it is understandably very private but I knew that the adoption agency was able to share occasional updates over the years about the child with the biological family. Every little bit of information was a gift. When Doris would fill me on what information she had, I could see that she cared very much for this boy that she might never know. She spoke about him like she did know him, like he was part of the family to her. It wasn’t in the words as much as it was her tone that gave her feelings away. About 6 weeks ago, I had one of my regular calls from Doris. Her voice has gotten weaker from her Parkinson’s. She was just home from a hospital stay and was put into Hospice care at home. Things have been hard for her health wise for a long time. And they aren’t expected to get better but that day on the phone she had more pep to her voice. Whoa – you had her at “baby”. I am not sure I have met anyone who loves babies more than Doris. She raised six sons, she helped with every grand baby if she was able. I remember once when she was visiting my neighborhood where I lived some years ago we were outside and my neighbor was walking with her newborn. Mom took a peak and the next thing I knew she was holding the baby – smiling ear to ear. To say she was excited about this baby news was an understatement. She was elated. She wasn’t even sure if they would ever meet but already she loved that little girl. On that quiet Sunday a few weeks ago, the day began routinely for my in-laws. My husband, Kevin, was spending the day with them so he had gone over early to make them breakfast. My in-laws are in need of constant care 24 hours a day. Three of the brothers share that responsibility but Kevin fills in from time to time. To his surprise Rich walked in. He came down from Philadelphia and was on his way to meet his son and family for the first time. They were meeting in Chevy Chase, MD at a restaurant for a late lunch. Everyone was very excited for him. I imagine he was pretty nervous. Later that day, Rich called to see if Mom and Dad Sweeney wanted to meet Allen and the baby. I guess lunch went well. They said they would be over in 30 minutes. Doris at first wasn’t sure it was a good time for them to come. But Kevin asked when is there really a better time. She agreed. When you are an ailing 90 year old person the present is all you really have. There might not be a day where she feels better – there will be a day where she isn’t here at all. My heart breaks just typing that, but it is the truth and I have to face it and accept it. None of us will live forever, not even the people we love. One thing I have learned along my life’s journey is that sometimes you have to seize the moment and I am so glad they decided to seize it that day. When Kevin heard that Allen and family were on their way, he was very excited and was staring out the living room window waiting for them to arrive. He went to check on his mom and there she was staring out the sitting room window also waiting in anticipation. (Like mother like son!). She wasn’t saying much but the excitement was apparent. This is how she has always been. All love. My mother-in-law has a rich history of loving people on contact. You have her instant love no questions asked. She loved me right away – not because I was so good at winning her over- I didn’t have to – she loved me simply because her son loved me. How many mothers-in-law are like that? I hope I am like that with my children. We have grown very close over the years and we have confided much with each other. We have had many laughs and some good cries. My own mom and I are very close so God must have known I needed two Moms in my life and he gave me my mother-in-law as a bonus gift. My Mother-In-Law is such an inspiration to me. Kevin and I have tried to open ourselves up to a loving life in the same way she has. In adopting our children we took a step that many would be fearful to take. Could you love a stranger’s child? Yes you can – the human heart is capable of huge expansion. Mom is a perfect example of the “love first, ask questions later” approach I think I have embraced much of my life. It can be risky – you open yourself up to hurt -but no risk – no reward. And there is great reward. I will never forget the day Doris met my son, Luke, for the first time- he was 8 months old and fresh off the plane from Kazakhstan. It was also the first time I was meeting my son. My husband had flown alone 16 days earlier to Kazakhstan to adopt our baby boy and was arriving at the airport early in the morning. My in-laws had arrived at the airport before I did. I was with my own mom and step-dad and I think I may have broken their necks as I flung the car in park and jumped out the door and ran into Kevin’s arms. My sweet mother-in- law was standing next to Kevin -outside in the arrivals area- cradling a tiny baby -my son. I will never forget seeing the look in her eyes as she handed me my son for the first time. That baby had her heart before he ever touched U.S. soil. Maybe I am more sensitive to this story of Doris meeting Allen because my three children are adopted. She is a symbol of my life too. I have wondered what would happen if my own kids got to meet their own biological family someday. Would they be welcomed, loved? Or would they be rejected? This is a huge fear any adoptive parent has for their kids. These kids live with a type of rejection their entire lives. Knowing a person gave them up is hurtful no matter how much love it took for someone to do so. I thought of Allan and how he must have been feeling about it all. I can only imagine. I bet he was excited and nervous together. I hope he realized 5 minutes in that he has always been a part of the family. It was like a dream when Allen and his family came to see my in-laws. It was something anyone might not realize how much they wanted until it actually happened .The conversation went well. Kevin asked a lot of questions and Allen had stories to tell. And Baby Reagan was the prize of the day. A wonderful gift to a 90 year old woman that has kept on giving weeks later. Later, when I spoke with her about it she said, “It was so comfortable- like we always knew him..and Oh that baby.” Oh that baby. My mother-in-law is the type of mom I strive to be. My life was not always filled with people that are so accepting when I was growing up -people who just love you for who you are warts and all. When I was growing up I always dreamed of being part of a large family. My parents divorced when I was 13 and I have one brother – who lives in another state. My dad was an only child – so no aunties and uncles there – and we didn’t see my mom’s side of the family often. There weren’t cousins to play with on family get-togethers. I flocked to my best friends homes to try to find some sense of connection. Like many lonely children, I had a great imagination and I would slip off into my world of a Pretend Family. I added big sisters and a little sister and big brother and even another little brother. I spent hours making up stories with these imaginary siblings. It got rather hairy one day when I decided to take a picture of me as a 5 year old to my sixth grade class– telling everyone it was my younger sister. That didn’t go over well with the head priest at my Catholic School when he found out. In my defense, Catholic families were large back in the day and I had schoolmates that came from families with nine kids – there was one family had fourteen and a pet raccoon – I had to do something to feel I measured up! It wasn’t until I married at age 35 that I found the sense of family I was hoping for. Kevin has 5 brothers, there are cousins and aunts and uncles. Is it perfect? No! No family is perfect. It would be too boring if it were. But to be loved and accepted as a sister and daughter has been a dream come true. To know my kids are accepted with such love has been so comforting. Maybe I have always looked for a sense of safety. Maybe I have used adoption of my children and maybe even the adoption of dogs to build that cocoon of safety around me – I am not sure. But I think there is something to that. I know that when you grow up, you often seek the things you didn’t have as a child. I now have the family I had hoped for long ago it’s not always easy and it can be messy but I have that sense of belonging and safety, which has helped me to grow as a person. 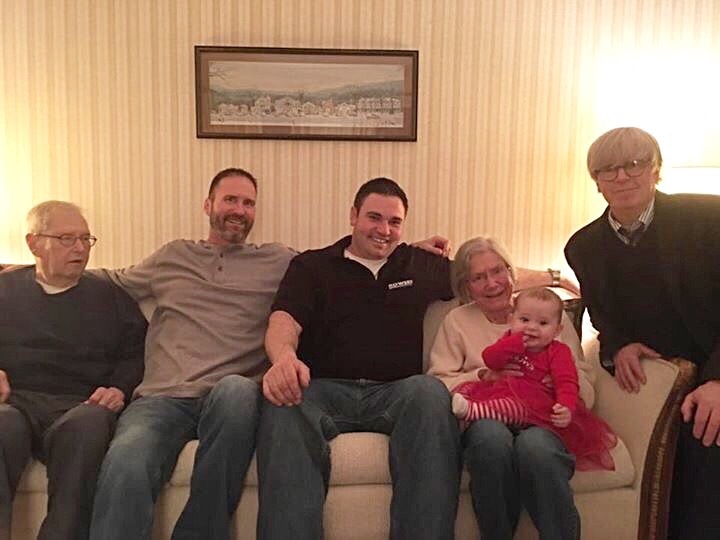 I am blessed to be loved by Doris -aka Mom – and to see the look on her face when she met her grandson and great-granddaughter for the first time – one of love and complete acceptance and happiness brought back all the gratitude I have for this family that has made me a better person. I hit the jackpot and got more love than I could ever feel worthy of but I will take it.